It’s emotions that drive most recreational activities. Golfers lay awake mentally repeating their swing or wondering how they missed an 18-inch putt. Duck hunters lay awake wondering how they missed a mallard that seemed to be motionless, wings set and coasting towards them in a light breeze. Anticipation is a huge part of hunting and all one needs to do is hang around one of the check stations at a public hunting area the day before a shoot day to get a feel for the duck-hunting roller-coaster ride. So it was for me on Wednesday morning. Awake at 3:45 AM, I was having a hard time gathering up the motivation to drive to Mayberry. At Mayberry, the duck hunting has been so bad for the last two months that I wasn’t sure I wanted to risk another disappointment. By 4:00 AM I had changed my mind about hunting – twice. However, the final decision was to go. Upon arrival at the club, the ponds were silent. Wading out, a handful of ducks passed by. While positioning decoys, a large flock of Ross’ geese took off from a field nearby and passed overhead at 20 yards. My shotgun was in the tules, but I wasn’t hunting for white geese anyway. I didn’t mind letting them pass by. Impatient, I tripped on the jerk string to my hen mallard decoy about five times and couldn’t get set up in the right place. Moved to another clump of tules and nothing seemed to be going right. After about a half hour, a pair of mallards passed by, low, and landed about 75 yards away, in a spot I had not been watching. This was a sign to move. Fortunately, with only a small decoy spread, it didn’t take long. The spot the mallards had landed in was closer to my usual spot. Moving caused the pair to take off. Then a few more ducks took wing and then a few more. Before reaching the new spot, 25 mallards rose and flew away. They had been sneaking in from behind. After setting out a pair of mallard decoys, a group of three mallards came in right away. Bang – miss, bang – miss, bang – miss, and away they went. Bummer. Soon after that another came in. Boom – one down. Lola made the retrieve. My heart was pounding. This is more like it. Mallard calling while jerking the string, another pair came in. Bang. Down went another drake. Soon thereafter another with same result. The fourth opportunity was a big flock, but the first shot was a miss. Down came a green head on the second. Things slowed down and Rob moved near me as he wasn’t getting any action at a different pond. On the way over he spooked a single drake mallard and it sailed into my jerking hen mallard. Boom, down he went. We hit a lull and a pair of mallards landed just out of range. Breaking with our custom of passing on birds once they’ve landed, I sneaked close to them. As they rose, the drake fell and Lola tracked it down. Later, Rob gave me a hard time. Six birds, pretty good day. Rob called on his spec call. I listed and heard some geese approaching from the north. Here they came. Boom, down went one of the group. A bonus bird. Lola wrestled the broken-winged goose. The goose lost the battle and we headed back to the cattails for one more bird. A pair of pintail passed overhead. I whistled at them as they circled. Jerking on the hen mallard decoy and whistling seemed to be working. They passed down wind and turned into the decoys. Then they passed by again, just out of range and circled back one more time. As they passed behind me I did a 180 and dropped the drake. Mission accomplished. Best day of the season. I spent the afternoon plucking. Lola sniffed the feathers. So the worm turned, my sanity is back and this weekend I’ll be more relaxed as the hunt approaches – not feeling pressure to kill a duck. Does it really matter? It did yesterday. My first involvement with endowments started during my tenure as a director for the Mule Deer Foundation. In the non-profit world, an endowment fund was thought of as a guarantee of survival. With a few million dollars in an interest-bearing account, the organization would be perpetually secure. Then along came Conservation Banking and a different twist on endowments – perpetual funding for land management. A requirement of the US Government, via the Fish and Wildlife Service, and California, via the Department of Fish and Game, endowment funding is used to create a steady stream of funds for use in management of privately-held conservation properties. In this scenario, money held in trust by a third party yields a return of cash at a predetermined rate in order to produce an income stream. The revolving fund pays the cost of activities necessary to maintain healthy habitat for wildlife. If all goes right, the program continues in perpetuity. Since the endowment guarantees that the cost of maintaining the land is covered, the developers of the conservation project can pass the property on to caretakers such as agencies or non-profits. In order to answer this question, information about the land and associated management activities must be determined. In the case of a Conservation Bank, surveys must be completed to determine existing species, habitat types and maintenance activities. Physical features that require periodic maintenance, such as fences, dams and roads must be quantified into units. The useful life of land improvements must be estimated as well as replacement and maintenance costs. The costs of other practices must be estimated by creation of a management plan that determines work to be done and the time needed to accomplish tasks. Wages, fees, supervision and administration must also be included in the mix. With a management plan and annual budget nailed down the rate of return on endowment fund is the next critical item in determining the size of the endowment account. The process of creating an endowment account is very revealing. Public and private landowners create management plans and budgets when acquiring property, but if a formal endowment creation process were a prerequisite to government acquisition of land, the public would be better served. “Buy now and figure out how to fund management later,” is a poor way to run any organization and in California that attitude has helped to put the taxpayer in the hole or facilitated the purchase of property that remains locked up because there is no funding available to pay costs associated with public use. It seems to me that endowment creation as a prerequisite to California land purchase would be good business practice and serve decision makers well by unmasking the true cost of property acquisition. 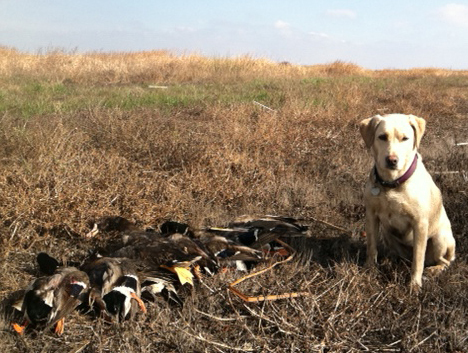 The 2011/12 waterfowl season will be remembered as the year of the spec (white-front goose). Duck hunting has been below par and I haven’t had many fully satisfying duck hunts this season, but the goose hunting has been fabulous. Friday was a personal first for me. For the first time in my life, the spec limit is six this season and Friday I left the field with a heavy duck strap of six specs. Fred also shot six geese, but we did it in different ways, both effective. I stuck it out over the decoys and eventually enough specs decoyed within good range for me to bag my limit. After sitting in the blind for several hours, Fred shifted to the pass shooting mode and got his birds. Pass shooting, moving into flight paths and bringing down birds at maximum range is a very good way to kill geese. But for me, nothing is as exciting has having a goose set his wings a few hundred yards out and sail down within range. On Saturday, I stuck with the decoy mode while Fred continued to seek out flyways and pass shoot. While I fired a couple shots on Saturday, Fred bagged four more geese with fast action for the first few hours of the day. No matter how you slice it, this will be the season remembered for the specklebelly goose. I’d decided not to duck hunt last Wednesday until I recieved a call about 9:30 AM. 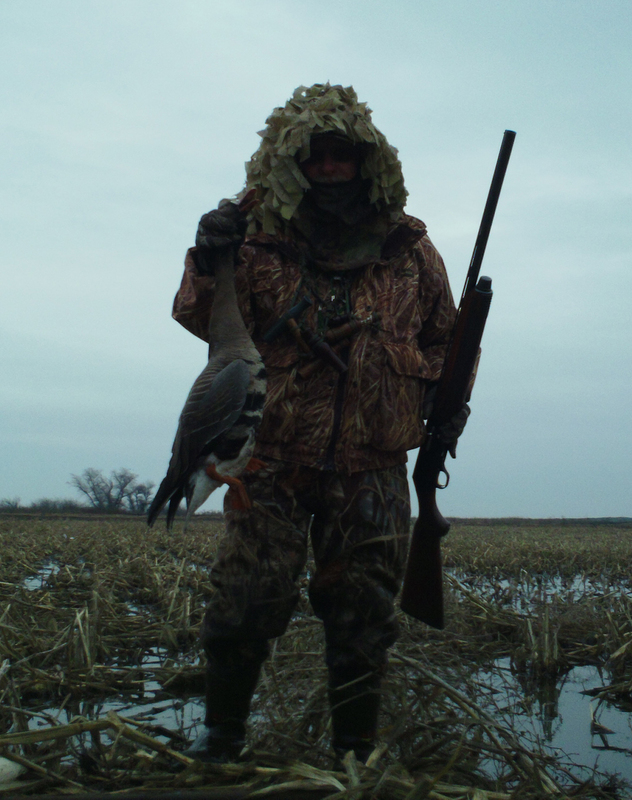 My friend Roger was headed for the grasslands with the intent of hunting the ADA blind at Kesterson WA or the Gadwall Unit. Roger has had hip replacement surgery and gets around slowly. His doctor has granted him a disabled hunter pass which allows him to hunt the blinds set aside under the Americans with Disability Act (ADA). He is entitled to also take a guest hunter, me. Our first attempt would be Kesterson, where Roger has had limited success finding an opening. 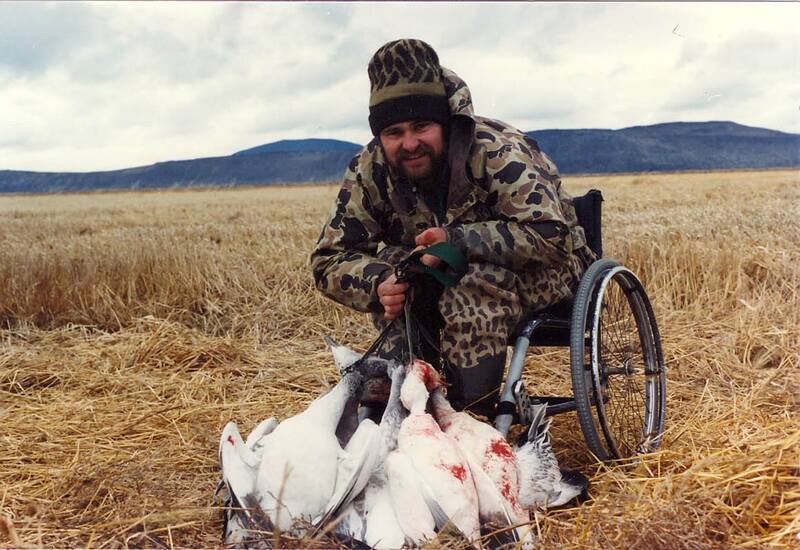 My first hunt in a special “disabled blind” took place about 20 years ago. At the time, I’d met a disabled hunter at Sacramento NWR while waiting in the sweat line. He was mobile, but limited to travel in a wheel chair. I don’t even remember his name, but he invited me to hunt with him at the only blind set aside for disabled hunters. He was a paraplegic and his disability also affected his shooting ability as he had limited strength in his hands, but he was proud of the fact that he was still hunting. A couple weeks later I received a photo of him with a nice bunch of snow geese taken at the Tule Lake spaced blinds. Disabled hunters are not limited to ADA blinds. This shot was taken at the Tule Lake spaced blinds in about 1990. The “handicapped” blind we hunted on that day was located on the edge of the access road. It was a tank blind, similar to the Yuba City steel doubles we used at our club. He was able to lower himself into the blind. We had some success and I remember him bringing down a hen mallard, while I managed a double on cinnamon teal. We didn’t hunt together again and I don’t remember his name, but I still have the photo he sent after his successful trip to Tule Lake. Surprisingly, on our most recent trip, the ADA blinds at Kesterson and the Gadwall Unit were filled, so we hunted the stake blind area at Salt Slough. ADA blinds tend to be a much better hunting opportunity these days than they were 20 years ago and they are in demand. 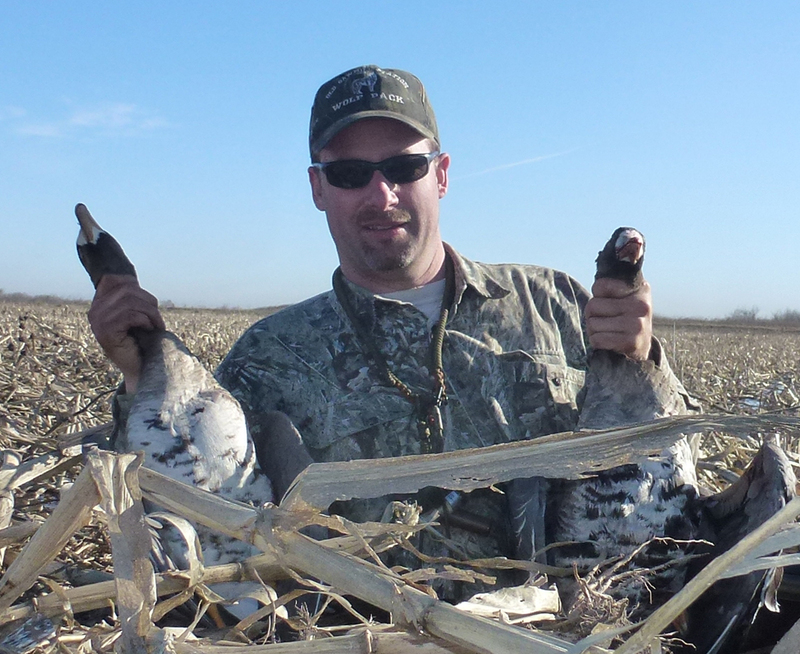 It was a tough afternoon for waterfowling, but we managed several chances at spoonies and took home a couple. The action was fast enough to keep us on our toes – all in all a good outing. Matt Bloom and I watched geese rise in the east as shooting time arrived last weekend. Check out the video. One of the side benefits of waterfowl hunting is observing the sun rise. Matt shows off a couple of our geese. Specs were the main target. California forests are now home to a lone male gray wolf which crossed over the Oregon border into California last week.